Skills are progressive and are built through basic movements. Helping athletes take the time to build the strength in basic positions allows the coaches at CFCM to help our athletes progress to more complex movements. CrossFit Critical Mass Skills class focuses on honing and developing fundamental skills to ensure quality movement patterns. The holiday season is coming to a close and you have probably had about all the ham, turkey, mashed potatoes, apple pie, and n-laws you can handle. In 2019, you’re probably also brainstorming ideas for getting in shape this year. Perhaps you have Googled the new diets and some trendy celebrity workout to try. Do you really think this is going to be the year when this old routine is going to do the trick? Instead, make this the year you truly commit to healthy habits and an improved new lifestyle – not the latest trend. These are the 6 reasons why CrossFit should be your New Year’s resolution! CFCM Foundations Program: Get Started Today! Join us for our Foundation program - all abilities welcome! 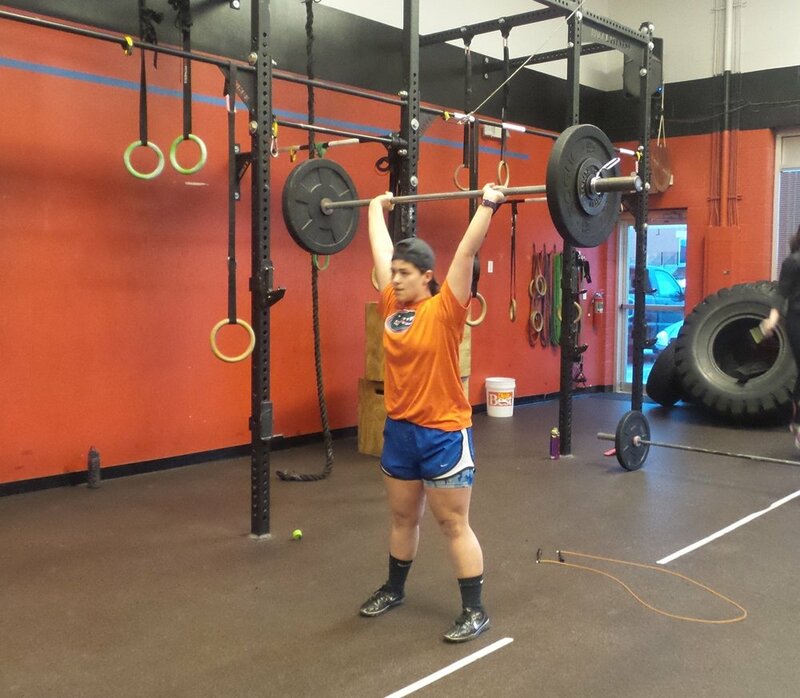 CrossFIt and Golf - Part I: Weightlifting by CFCM Coach John FInk. Our coaches routinely express that it's not always about coming in and completing the workout of the day, it is also about how your positive energy can influence those around you. Thankfully, across the board, the CFCM athletes set the example of what it takes to believe in others' progress as much as their own. We are grateful that our athletes show that the way you carry and believe in yourself is not only vital to your own personal growth, but to the athlete that may be looking at you as their motivation. The December 2016 Athlete of the Month (AOM) is another example of how positive energy helps others. Gianni ("Tights") Pablos constantly has a positive attitude in and out of the gym. His personality rubs off on everyone around him. A close friend summed it up, "He leads a very well balanced, happy, and productive life, in all aspects of life. He makes those people around him better because of his attitude and abilities in all aspects". We would love to go on and on personally about Gianni, but we cannot forget to describe the type of athlete he is. He's a well rounded athlete that tackles all his weaknesses head on. Over the last six months, Gianni has found something in his fitness. No, not new tights! He has found a heightened level of intensity that we can see in each of his workouts. He's found that balance between technique and intensity that is important to athletes. This is evident in the numerous personal records he has achieved over the last few months, in his back squat, deadlift, and press to name a few. Not to mention, he is now able to string together multiple muscle-ups. More importantly he did all this while still supporting others in their personal growth. This support and leadership is worthy of recognition. So the coaches of CFCM would like to congratulate Gianni on his selection as the December 2016 AOM and also on his recent work promotion. Gianni, continue to be humble, kind, motivating, and never forget your tights! CrossFit Critical Mass was founded based on a family friendly environment of support and community. We are a small CrossFit community nestled in the heart of Maple Lawn, Maryland, where a family of friends support whenever and wherever needed. This support has been on display over the last 4 years and again this weekend. It warms our hearts to see a family come together to support one another. This weekend it was evident that miles will not limit or interfere with our community support team. We had athletes competing as far as Miami and closer to home in Virginia, and our CFCM family was out to support in full force! Coach Ali Brill participated as an individual in Wodapalooza Fitness Festival (WZA) in the RX Women's division. WZA starts with a mandatory three week online challenge. Coach Ali's performance in the online qualifier earned her the opportunity to participate in the 3 day competition in Miami, Florida, with some of the best CrossFit athletes in the world. Coach Ali not only earned her spot to compete, but left her mark as one of the best athletes and a force in the Mid Atlantic Region by finishing 29th in her division. We can't wait to see you crush the Open, Brill. The Lorton Games - The Masters took over Lorton, Virginia and CFCM was also there in full force. The Lorton Games had over 55 teams that participated in this event battling for some of the fittest masters athletes in the area. We had 4 teams compete from our CFCM community. Our teams put on quite a display with 3 of the 4 teams making it to the finals. Phillip Kennedy and Coach Duane Graves just missed a spot in the finals by 2 points with a 6th place finish (12 teams). A new team partnership that will be heard in the future, so stay tuned. Great job guys! In the finals, the other 3 teams had some tough competition. That competition did not phase Mike Ellis and Marcus Scaidini. They dropped down an age class and team Dirty Old Men showed up and was recognized by taking 4th place. Nothing about these 2 is dirty or old - more like strong and unstoppable. Great job fellas! Throughout the day Tracey Perrick and Coach Kim Boettger took on all competitors by dominating the top 3 spots all day. That did not change in the finals where team Wonder Thighs took that 3rd place podium spot in the 35-39 Women's division. This was their first time competing together on a 2-person team, but they have competed together in the past. Their excellent communication was once again on display. We see these athletes dominating even more competitions in 2017. Rounding out a day of milestones and great achievements was CFCM's team in the 35-39 Men's Division. This team is another new pairing that showed another perfect match of skill and strength. All day, the combination of Adam Fisher and Coach Mike (Team Legion of Doom) held the number 1 spot. The competition was on their heels and they expected the finals to be no different. So in the final workout, they took control of their fate. They left their mark with a near flawless completion of the final WOD by blowing away the pack and walking away with the highest spot on the podium. We had a great crowd of supporters cheering on these athletes throughout the weekend. We are once again humbled and grateful for our community and the people in it. What a weekend! Our competitors thank you all for your support and giving them the opportunity to represent CFCM. Now, see everyone at the Open! November 2016 Athlete of the Month, Dawn Smith. CrossFit goals are not always accomplished within the walls of the box. Sometimes these milestones and fitness goals extend out of the gym. Our October 2016 Athlete of the Month (AOM) has proven a lot to the coaches in his short time with us. Joe Anderson is committed to putting in the hard work. Like all our athletes at CrossFit Critical Mass (CFCM), he allows the coaches to guide him in his fitness journey,, However, the coaches can only guide. The work is performed by the athlete in and out of the gym. In order to to describe Joe's commitment, I have to start with what happens outside of the gym. Joe will admit that he wanted to quit smoking cigarettes, since the first day he attended Foundations. Not only did he quit, but he is now three months in and is seeing the benefits of his stopping smoking. We know this was not and is not easy, so Joe, we applaud your strength and dedication. In the gym, his accomplishments are just as exciting. He recently hit multiple PRs, but the one that we would like to highlight is his overhead squat. Mobility is a challenge for most new athletes and Joe was no different. For Joe, the overhead squat has been especially challenging due to some shoulder mobility issues. He has spent time working on his mobility, and it is paying off with his recent 15lb overhead squat PR. We also applaud that even though he may sometimes arrive later than everyone else in the warm-up portion of class, he still manages to make it to the main floor before the skill/strength portion! 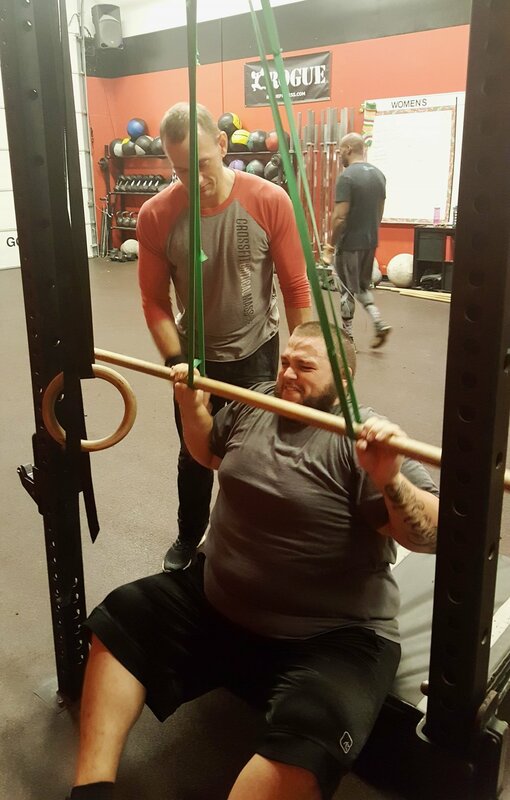 Joe's dedication and drive are a true example to every one in the gym-coaches and athletes alike. We are fortunate to have him train with us and cannot wait for him to keep smashing his goals! Please join the coaches in congratulating Joe Anderson as the CFCM AOM for October 2016. CFCM is proud to announce that Camille Williams is our August 2016 Athlete of the Month! This choice is especially exciting for us, mostly due to Camille being the one of the youngest members of CFCM, yet one of the most dedicated and hard working. At just 12 years old, and in the seventh grade, Camille has made CrossFit and fitness not only a priority in her life but instills it in her family as well. Even during our winter storm, we saw Camille make up mini in-home WODs for everybody in ther house. There's a lot to be said for that kind of commitment, especially because many young people today are absorbed in their technology and social media platforms, but not Camille. Camille proves herself to be outside that norm. She actually started our kids program in 2015, merely as a way to complement her interest in dance. However, she quickly adapted into the CrossFit world, and actually transitioned into the adult classes last spring. Camille constantly works on exercising proper form in all of her movements. She is efficient and thorough, and is not afraid to ask coaches for help or direction. She actually said one of the things she likes most about CrossFit and CFCM, is the fact that the coaches and other gym members know her name and show support personally. Camille appreciates not being just another face in the crowd, but truly welcomed and accepted by others. Ever since beginning CrossFit she has made tremendous improvements and progress. She is now hitting a consistent stream of PRs in deadlifts, squats, and Olympic lifts! She has even stated how much she enjoys GHD sit-ups! Her commitment to CFCM has not only shown in her increasing strength and endurance, but her dance teachers have noted her accelerated progress ever since she started CrossFit. Camille is truly an impressive athlete and we are happy to have her working out by our sides. Let's congratulate her in her accomplishments and as our newest athlete of the month.